Leverage state-of-the-art technology to become a master storyteller across a wide variety of platforms. We are delighted you are interested in Asbury’s media program. 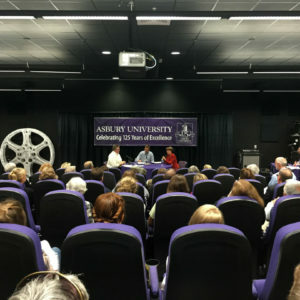 The Asbury University media program is unique in that it has been able to attract industry-successful faculty, who are committed to students, to teach in the classroom. Students receive unparalleled opportunities to apply those theories and skills to real-life situations using state-of-the-art equipment. The result is one of the highest graduate media-hire rates in the nation. Why Study Media at Asbury University? We are often asked how our program compares to other university media programs. We have put together some information in to a PDF that will help you compare other media programs with ours. We think that you will be surprised to see the depth of our academic program, the myriad of media opportunities and the cutting-edge film and television production gear…all within a Christian liberal arts context. We now offer bachelors (B.A. ), Masters in Digital Storytelling (M.A.) and two different Masters of Fine Arts (M.F.A.) degrees in Screenwriting and Film & Television Production. So, check out the different areas of our site and if you have any questions, feel free to email me. We look forward to seeing you at Asbury. Asburians have worked on more than 350 theatrically-released films and more than 500 network television productions, and have won over 60 Emmy Awards. Additionally, they have worked on films that garnered 91 Oscar nominations (and won 23) and been cinematographers or editors of films screened at three Sundance Festivals.